The 2019 Super League season is upon us, and with Betfred – the title sponsors – we bring you a preview of the new season, as we look through each side looking for glory in the Grand Final. Betfred says: Castleford were dealt a huge blow on the eve of the 2019 Super League season, with the news that Luke Gale is out for the most – if not all – of the campaign through injury. However, last season’s semi-finalists still have an abundance of talent, a great coach and you can for sure expect them to be there or there about again this time round. Betfred says: The Dragons went from relegation favourites in April to Challenge Cup winners and top-six contenders by August last season. There’s no reason why, given the addition of Matty Smith and Sam Tomkins, that this talented squad can’t progress even further, after winning their first piece of silverware, in 2019. Betfred says: Having joined the Giants half-way through last season, Simon Woolford will be looking forward to leading Huddersfield for his first full campaign. There’s a lot of promise with this new-look Giants side, having lost and gained some big names in the off-season, and they will be quietly confident of surprising many throughout the season. Betfred says: It was a disappointing campaign last year for Hull FC, finishing bottom of the Super 8’s. They’ve stuck by manager Lee Radford and with a fully fit squad plus a couple of new additions in Matty Dawson-Jones and Levy Nzoungou, it’s likely we will see a much better version of the Black and Whites this season. An interesting season ahead for them. Betfred says: After a season in the Championship, Hull KR made a swift return to the Super League last year and boss Tim Sheens will be pleased with how his side fared back amongst the big boys. The signing of Danny McGuire proved instrumental for the Rovers and they have built on that further by the recent star signing of Catalans’ Josh Drinkwater and Kane Linnett, amongst others. It’s going to be very intriguing to see how the Robins get on this campaign. Betfred says: It’s a case of new beginnings for the Leeds Rhinos this year, who the season after winning the Super League found themselves in a fight for survival in The Qualifiers. They’ve gone all out to get themselves back in the mix this season, acquiring experienced boss David Furner and three top class overseas signings. It’s very much expected that the Rhinos will be right back up near the top of the table this campaign. Betfred says: London are back in the Super League for the first time since they were relegated in 2014 after navigating the most competitive Championship in years to earn a place in the Qualifiers and beat the odds to beat Toronto in the Million Pound Game. They’ve made some signings with Super League experience and they proved that they thrive as underdogs – but it’s such a competitive field and the task is a big one. Betfred says: Off-field antics didn’t help Salford last year, though they finished the season strongly – topping The Qualifiers. They will be looking to bring that end-of-year form into the new season, spearheaded by the performances of stand-out star Jackson Hastings and new recruit Ken Sio. As mentioned, this is a competitive season for the Super League, but the early signs are promising for the Devils in 2019. Betfred says: Despite losing at the semi-final stage of both the Super League and Challenge Cup – not many would argue if you said St Helens were the best side last year. Saints, inspired by Man of Steel Ben Barba, ended as League Leaders and are the joint favourites for the 2019 season. Despite the departure of Barba, they have picked up top-class talent in Kevin Naiqama and Lachlan Coote, plus the return to fitness for Alex Walmsley. They look arguably even stronger and will take some beating. Betfred says: It was another year of steady progress for Trinity who again just narrowly missed out on a semi-final spot. Three of their players made the 2018 Dream Team and they have picked up further talent in the return of Danny Brough and the arrival of former Wales captain Craig Kopczak. Can they go one further this season and make the semi-finals? It’s very possible, and they’re for sure one to watch. Betfred says: Warrington bounced back from a disappointing 2017 by finishing runners-up in both the Super League and Challenge Cup last year. Although picking up no silverware, the Wire should be positive as it was a year of genuine progress. The marquee signing of Aussie Blake Austin, who is a front-runner for the 2019 Man of Steel, will only make them stronger and there’s absolutely no reason why Wolves can’t win the Grand Final this time round. A strong season ahead surely. Betfred says: The champions. 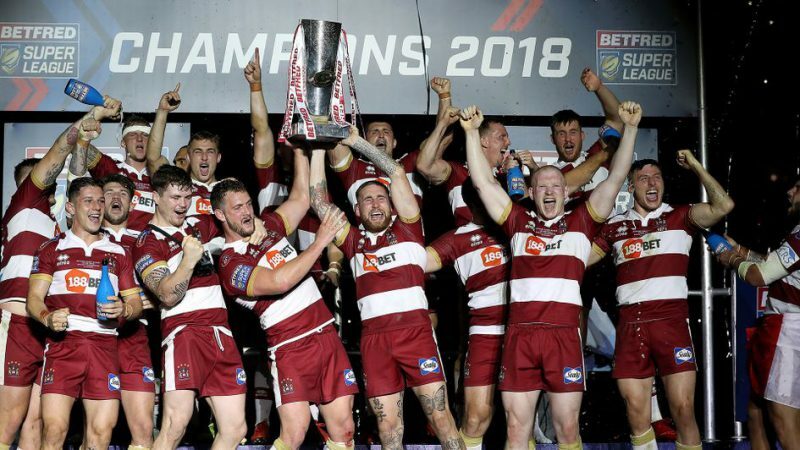 Wigan found their form at the right time as they went on to win the Super League Grand Final after a remarkable run at the back end of the season. A tough ask to defend their crown after losing key players Sam Tomkins and John Bateman, as well as long-serving coach Shaun Wane, but with interim boss Adrian Lam bringing in undoubted talent Zak Hardaker it’s almost a given they’re looking at another successful season. Odds accurate; 30/01/2019 12:00 am.